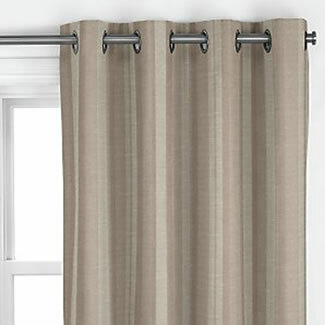 Transform the look of any pair of curtains by changing from hooks to eyelets! We can alter any 66" tape top curtains to eyelets to help transform your favourtie pair of curtains to suit you. Only available on 66" (168cm) width curtains. Also please note that when eyeletting you will lose 3" off your length. Example, If your readymade curtains are 66" x 72" your finished length after eyeletting will be 69". Price is per pair of curtians. Please note we offer three colour eyelets - Silver, Antique Brass and Black Nickel. Please state in your order comments which colour eyelets you require. Finally there are No returns, refunds or exchanges on curtains that have been custom eyeletted.